India swelters through deadly heatwave while awaiting monsoon arrival. With heat wave temperatures continuing to hit 46C and 47C across parts of India, heat related deaths are quickly rising. The death toll as of Friday 29 May stands at over 1800 official heat-related deaths and rising, most from the states of Andhra Pradesh and Telangana. While India awaits arrival of the monsoon, the lack of thunder storms and clear skies has allowed temperatures to rise, with UV radiation reaching dangerously extreme levels, as the heat blows in from Pakistan. With rising temperatures associated with climate change, extreme heatwaves are expected to start earlier in the pre-monsoon season, last longer and be more intense. * May 31 Times of India announce death toll has passed 2,000 to become the fifth deadliest ever heatwave in the world and the second deadliest in India. * May 28 The Age reported that Hospitals overwhelmed as India heatwave toll nears 1500. * May 27 - The Hindustan Times updated the death toll to over 1100 people. * May 27 - The Sydney Morning Herald report, says death toll at over 1000 people, with the roads in Delhi melting. * May 25 - According to a CNN report the heatwave has now killed more than 700 people in less than one week. In regard to the death toll being updated, I suspect these are only medically diagnosed figures relating to sun-stroke and heat-stress related mortality. So the numbers are likely to be vastly understated. Due to the extent of poverty, many deaths may be inadequately reported to health authorities. Determining deaths from heat related causes is also very difficult as it is the heat and dehydration that often exacerbates other conditions resulting in death. The way we, in the developed world, estimate heat related deaths for extreme heatwave events is through a statistical comparision of deaths in the heat wave period to a similar non-heatwave period = excess deaths. This method statistically captures the great number of deaths that might be attributable to the extreme heat event. Researchers of the Ahmedabad Heat Climate Study Group analysed all deaths in Ahmedabad in the 2010 heatwave and compared it to all deaths in the previous year (2009) and the subsequent year (2011) to find out the real number of excess deaths attributable to a heatwave. Their results, published in the journal PLOS-ONE in March 2014 were stunning. While the official death toll due to heatwave conditions was recorded as 50, the study found an excess of 1,344 deaths in 2010 over other years. That's a 43% spike in deaths due to heatwave conditions, and that too in a city which is used to high temperatures. The Times of India reports (May 27) that ultraviolet radiation is extremely high, causing much more sunstroke. "The steep rise in sunstroke deaths in Telangana and Andhra Pradesh is the result of the ultraviolet (UV) radiation index in the two states that stands at a critically high figure of 12", the article says. UV radiation started to be measured in India two years ago using the scale of 1 to 11, so the UV radiation in Telangana and Andhra Pradesh is literally off the scale. On Tuesday and Wednesday UV radiation was measured in Delhi at greater than 8. According to Beig, the 1-4 range on the UV index is considered as no risk, while 4-5 and 5-7 are considered as low and medium risk respectively. "7-10 is classified as high risk range," he said, adding that anything beyond the range of 10 is termed as "critical" or "extreme risk". Under the last two categories all people are advised to avoid direct sun exposure. "One of the reasons for the high range of UV rays is rising temperature. Also, these cities are close to the equator. However, in the case of Pune, it is more closer to the equator than Delhi and this is why the UV range is higher there despite recording lesser temperature," Beig said. 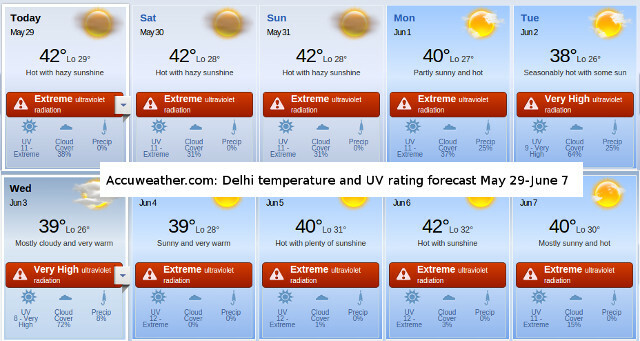 Forecast for Delhi from Accuweather.com showing max and minimum temperatures and extreme UV radiation. For June 4 to June 6 the UV index for Delhi is forecast to be 12, a critically extreme level. Sunburn, dehydration and sun stroke can result after too much exposure to ultra violet radiation. "When the exposure is for longer term like it has been happening for the past one month when UV index is more than 7, UV radiation induces degenerative changes in cells of the skin, fibrous tissue and blood vessels leading to premature skin aging, actinic keratoses. Another long-term effect is an inflammatory reaction of the eye," Beig concluded. The national capital of Delhi experienced it's hottest day, recording 45.5 degree celsius. The Palam observatory in Delhi recorded a maximum temperature of 46.4 degrees, according to The Times of India. According to Time report 27 May, over 850 people have died from heat related causes in the southeastern Indian state of Andhra Pradesh. In one district there were more than 200 lives lost due to the extreme temperatures. Officials said that in neighboring Telangana state, at least 266 people have died. But all states are reporting deaths due to the extreme heat. Khammam in Telangana reached 48 degrees, breaking its previous record of 47.2 set in 1947. The Hindustan Times opened their story with "Humans “boil in their own skin” at 48 degrees Celsius, the maximum temperature recorded at Khammam in Telangana..."
Some areas also are suffering stifling humidity levels accompanying extreme temperatures. This compounds the problem as human bodies cannot cool off and self-regulate body temperature, if temperatures exceed 35C and there is also high humidity. 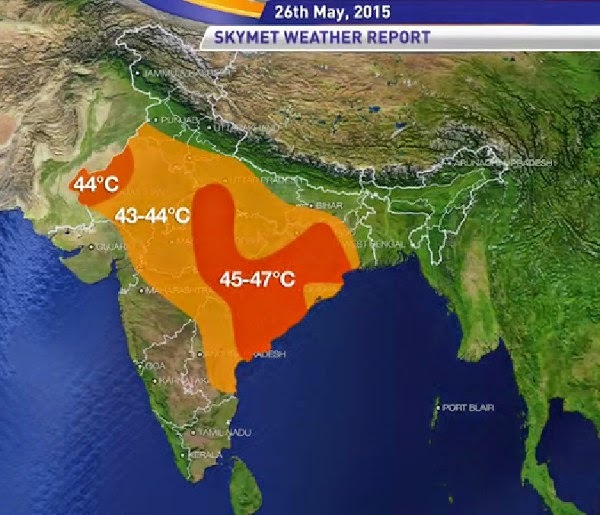 In Uttar Pradesh’s capital Lucknow, the city recorded a maximum temperature of 43.5°C with relative humidity at 70%. Agra was the hottest part of the state with the mercury hitting 46.1°C, reported the Hindustan Times on May 27. 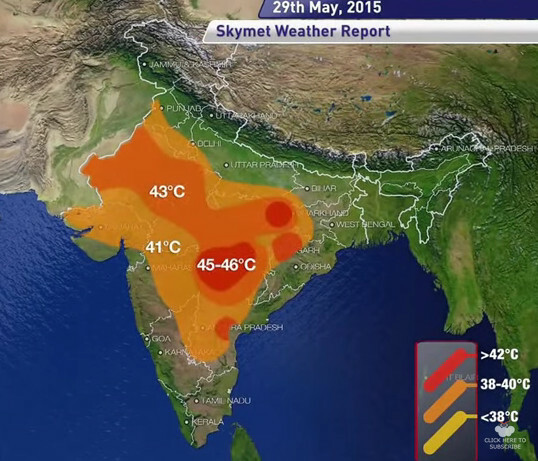 Most places in Rajasthan had temperatures hovering around 45 degrees. According to a report in the Hindustan Times, "Allahabad was the second hottest at 47.7°C, six degrees above normal; Nandigama in Andhra Pradesh was a notch under as it sizzled at 47°C while Odisha’s Angul district tipped the scales at 46.7°C. Heat wave conditions prevailed at many places over Vidarbha on 20th May; at a few places over Rajasthan on 17th, 18th & 19th; over Telangana and West Madhya Pradesh on 20th; over Vidarbha and Madhya Pradesh on 18th & 19th; and at isolated places over West Rajasthan on 16th, 17th & 18th; over Gujarat on 16th & 17th; over West Madhya Pradesh on 17th; over Marathawada and Telangana on 19th and over East Rajasthan & Coastal Andhra Pradesh on 20th. 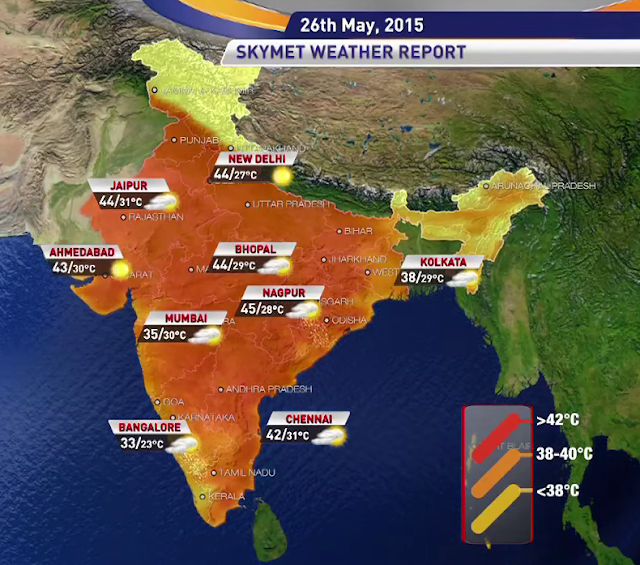 Heat wave to severe heat wave conditions are prevailing at a few places over Odisha and Coastal Andhra Pradesh. Heat wave conditions are also prevailing at a few places over Haryana, Chandigarh and Delhi, Rajasthan, north Madhya Pradesh and Chhattisgarh and at isolated places over West Uttar Pradesh, Jharkhand and Telangana. 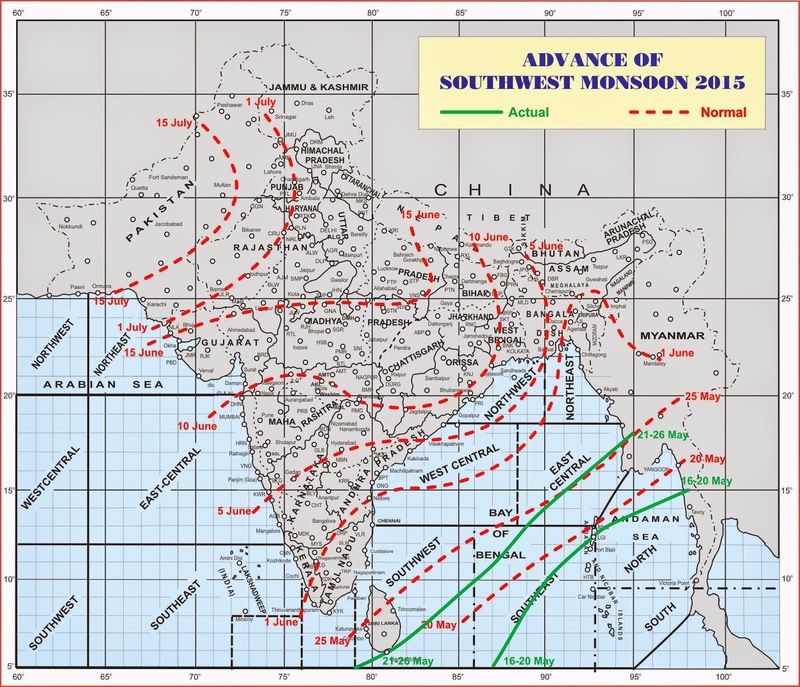 Minimum temperatures are above normal by 2­-4°C at most places over Kerala; at many places over Rajasthan, Uttar Pradesh, north Madhya Pradesh, Saurashtra and Kutch, Odisha, Coastal Andhra Pradesh, Telangana, Konkan and Goa and Coastal Karnataka; at a few places over Uttarakhand, Gangetic West Bengal and Tamilnadu and at isolated places over Punjab, Haryana, Gujarat Region, Vidarbha, North Interior Karnataka and Rayalaseema. They were below normal by 2­3°C at many places over Jammu and Kashmir; at a few places over Himachal Pradesh and Assam and Meghalaya and near normal over rest of the country. The highest maximum temperature of 47.0°C was recorded at Angul (Odisha). According to a Guardian report many of those reported dead are poorer people who are homeless and beggars, and labourers and construction workers on building sites working under the direct sunlight. It was reported that taxi drivers in Kolkata refused to work between 11am and 4pm due to the heat after at least two drivers died in their cabs due to the heat. There were also reports of power cuts across India's poorly maintained and inefficient electricity network that is reliant on about 60 percent coal powered generation. Intermittent power and water supply often occurs during the stifling summer heat of the pre-monsoon season. Summer is also when traditional power generation and transmission suffer losses due to extreme heat. Coal power pollution is already responsible for an estimated 100,000 deaths per year in India. Rapidly expanding renewables of 100GW of solar power to the grid by 2022 will help ease power shortages and the stability of the electrical grid and drive creation of up to one million jobs. Solar power with either battery storage or local decentralised grid with battery storage, such as envisioned by Elon Musk in the rollout of Tesla Energy Powerwall product, may make a substantial difference in future to many rural communities in India, largely skipping the fossil fuel generation economy with all it's attendant pollution problems. Many people seek some respite from the temperatures in shops , shopping malls, and Delhi's air-conditioned metro. Only about a third of the country's 1.2 billion people have direct access to electricity. Day temperatures are forecast to fall by about 2° C over Andhra Pradesh,Telangana and Vidarbha from 28th May onwards leading to a slight abatement of heat wave conditions. The monsoon is expected to arrive from the start of June, to relieve extreme summer temperatures, but may take several weeks to reach the dry and hot north west states. There is definite room for improvement in health warning alerts, public health warnings and education, and incorporating heatwave response as part of disaster management plans. While May and June are traditionally hot months in much of India, the frequency and intensity of heatwaves is increasing. Large cities in particular generate an urban heat island effect whereby temperatures are several degrees hotter than the surrounding countryside and heatwaves further amplify this effect. While Governments have started issuing heatwave alerts and advising people to seek shelter in the hottest parts of the day, and to wear protective clothing and hats, this falls far short of all that could be done to avoid heat related deaths. An article by Nita Bhalla for the Thomson Reuters Foundation on May 29, 2015 articulates the need for Indian government's to engage in climate adaptation heatwave emergency measures. "The spiking temperatures underscore the need for local heat adaptation plans and early warning systems to reduce the health effects of heat stress and increase resilience in local communities to rising temperatures," said Anjali Jaiswal from the U.S.-based Natural Resources Defense Council (NRDC) in the article. "Ahmedabad's Heat Action Plan - South Asia's first early warning system against extreme heat waves - is tailored to help protect the city's vulnerable communities during these disasters." Indeed, cool refuges need to be established where people can seek refuge or respite from the heat. Ahmedabad rolled out it's heat action plan in 2013 and 2014, a first in South Asia. (See INSIDE STORY: Addressing heat-related health risks in urban India: Ahmedabad’s Heat Action Plan) This included an early warning system, increased community education and outreach in how people can protect themselves, assessed population vulnerability, build capacity in the health system, and established up cool refuges in malls, temples and public buildings. That is a great start. Ensuring access to water is also important for people to remain hydrated. Even simple measures such as moving the neo-natal ward in a non-climate controlled public hospital in Ahmedabad to a lower level of the hospital, made a substantive adaptive difference, according to this study by Kakkad et al (2014) titled Neonates in Ahmedabad, India, during the 2010 Heat Wave: A Climate Change Adaptation Study. Addressing the urban heat island will require more substantive action of increasing trees and tree canopy in urban areas, to moderate temperature build up from city surfaces. Ahmedabad has low tree density, even though it has a high proportion of old and giant trees with a high social and environmental value. During 2011, about 620,000 trees were counted within the area that falls under Ahmedabad Municipal Corporation, amounting to a tree cover of only 6.7 per cent. Many of the city's oldest and largest trees are threatened by urban development, and many of the new trees are simply not given the space to grow to a huge size, according to a Times of India report. According to ZeeNews report, only earthquake, drought, flood, landslide, hailstorm and cold wave qualify to be declared as natural disasters. This must change with heatwaves also being included in disaster management planning. Heat waves are expected to intensify around the globe in the future, with potential increase in heat stress and heat-induced mortality in the absence of adaptation measures. India has a high current exposure to heat waves, and with limited adaptive capacity, impacts of increased heat waves might be quite severe. This paper presents the first projections of future heat waves in India based on multiple climate models and scenarios for CMIP5 data. We find that heat waves are projected to be more intense, have longer durations and occur at a higher frequency and earlier in the year. Southern India, currently not influenced by heat waves, is expected to be severely affected by the end of the twenty-first century. 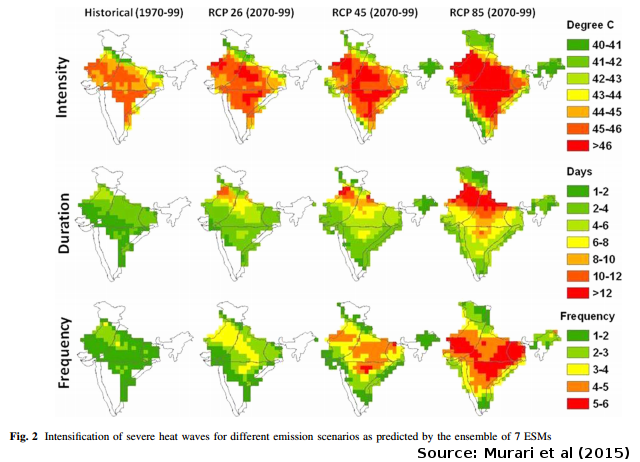 Projections indicate that a sizable part of India will experience heat stress conditions in the future. In northern India, the average number of days with extreme heat stress condition during pre-monsoon hot season will reach 30. The intensification of heat waves might lead to severe heat stress and increased mortality. The projected intensification of heatwaves will increase heat stress in labour productivity as discussed by Dunne et al (2013) See my February 2013 review article: Climate change to increase heat stress, reduce work capacity. The researchers of the Indian study argue that, if mean temperatures were increased by 3 C, a large part of India could experience extreme heat stress conditions. They note in their study that projections of climate conditions by mid to the later part of the century show a great many more extreme stress days over a large region of India. The study highlights that in particular northern India is projected to experience extreme heat stress in the future. This projected increase in heat stress combined with the lack of infrastructure, high population density and large workforce in agriculture, is likely to lead to substantial heat-health risk to the population of northern Indian states. "heat wave induced mortality in Delhi is projected to be higher, followed by Orissa, Maharashtra and Rajasthan. In the period 2010–2039, mortality projections under all three scenarios and by all the models are similar. The projection of mortality for Maharashtra is more than double that of the historical period. Furthermore, we observe that mortality projections under RCP26 are not very high, except for Maharashtra. This suggests that heat wave impacts could be limited if global warming is restricted to 2 C."
Climate adaptation will be an essential feature of dealing with heatwaves of the future in India, and the researchers indicate that the first step is alerting policy makers in the government to plan an adequate public health response, including a better warning system, as well as a heatwave adaptation policy as part of preventative disaster management plans. Already the National Disaster Management Authority (NDMA) has decided to recommend inclusion of heatwaves as one form of natural disaster. "I have been interacting with the home ministry and very soon there will be a decision on the inclusion of heat wave in the list of natural disasters," NDMA vice-chairman Marri Shashidar Reddy told the Times of India. The researchers also called for more extensive and elaborate research to better understand the risks of such catastrophic events in the future. 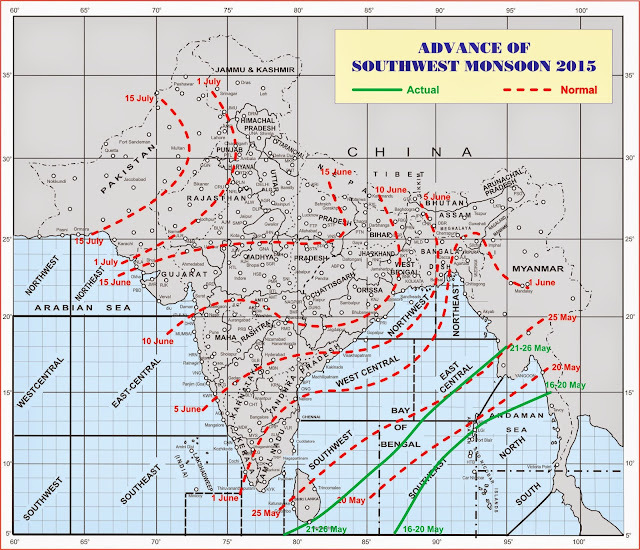 Map image of monsoon approach from Indian Meteorological Department.